Barking is a natural part of being a dog – it’s how your pup communicates. Sometimes, however, it can turn into an excessive habit that leaves you (and others) feeling slightly irked. There are a variety of reasons your dog could be barking; they may be hungry or they could have seen a squirrel outside. Maybe they just want you to stop watching Netflix and start paying them some attention. If your dog likes to bark up a storm any time they notice something a little out of the ordinary, you are not alone. 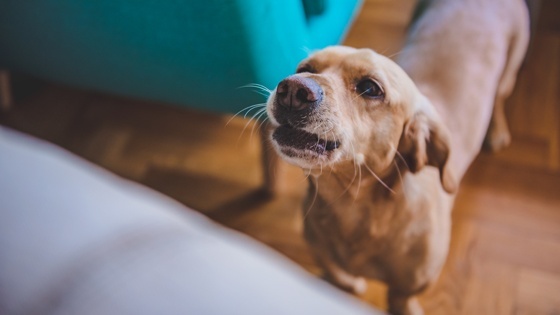 What options do you have to stop your dog from barking, humanely? When your dog is persistent in barking for extended periods of time it can be hard not to want to yell back. However, if you are feeling agitated, your dog will feel agitated too. It is important that you stay calm and react with a controlled response such as a look, spoken command or even a vibrational or ultrasonic correction delivered with a smart collar. As soon as your dog stops barking, even if it’s just for a moment, give him a treat and praise him. When using a smart collar, send a deterrent after your dog starts barking then wait for them to stop and deliver a treat. By doing this exercise repeatedly your dog will learn to respond more quickly to the deterrent and will learn to associate silence with a positive outcome. If watching people from the window or seeing another dog triggers your dog to bark, try controlling when he sees this trigger by having a friend walk by or bring their dog out on command. When your dog sees the stimulus, reward him with a treat so that he begins to associate the trigger with a positive outcome and become desensitized to the stimulus. Sometimes barking is due to pent up energy and aggression. If you add an extra walk or half hour of playtime into your day, you can help your dog to release this extra energy in more productive and healthy ways. For a more mental challenge, try activities like herding or agility training to hone your dog’s focus. For dogs with separation anxiety that resort to barking, try leaving them interactive toys like a KONG full of peanut butter to keep them occupied while you’re gone. To help reduce their stress levels about being left at home alone, try using a pheromone diffuser to provide a calm, comforting atmosphere. When it comes to curbing your dog’s barking habits, a smart collar can be your biggest asset in training. With the Wagz™ Explore Smart Collar, you can get alerts about barking activity, check in with HD video to see what’s happening and send your dog a humane deterrent – all from from your phone.